P.O. Box 1380, Bradford, Yorkshire BD5 5FB. Paul Dyson's Who's Who of The Yorkshire County Cricket Club is a most worthy and invaluable book for all cricket but especially Yorkshire fans. It is essentially an extension of previous books, Tony Woodhouse's A Who's Who of Yorkshire County Cricket Club and Peter Thomas's Yorkshire Cricketers, and offers a sketch of every Yorkshire player to have represented the famous county in all formats of the game. With Thomas's book being published in the first half of the 1970s and Woodhouse's nineteen years later, many fans will be indebted to Paul Dyson for bringing out an updated players guide. As one of the most celebrated and successful county sides, Yorkshire can boast many of the most famous names including Rhodes, Verity, Close, Boycott, Trueman, Hutton and Illingworth amongst many, many others. 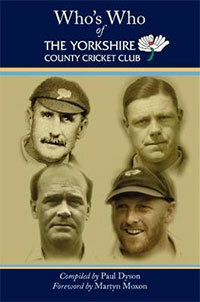 A description accompanies each player profile whether the player appeared for the county for many seasons or just a Twenty20 match. County career figures for First-class, List A and Twenty20 complete the book of all 670 men who have represented the county. Beautifully bound and put together, this is an essential reference book for supporters of the game and county.